MANHATTAN — Federal investigators are narrowing their review of key pieces of evidence recovered from a fatal bus crash in the Bronx to help determine how the tour bus bus flipped over the weekend, killing 15 people aboard on their way Chinatown. The latest casualty came early Monday morning when 70-year-old man died from wounds suffered in the horrific accident, St. Barnabas hospital authorities said. 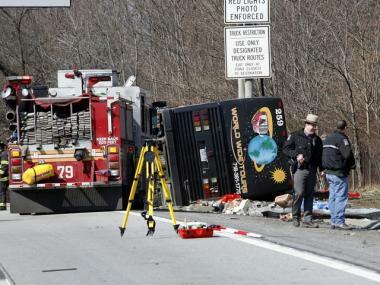 The bus's engine control module, or "black box" may help authorities determine how fast the vehicle was moving at the time of the crash, which occurred early Saturday on I-95 as the bus was returning to Manhattan from the Mohegan Sun casino in Connecticut. Investigators work to find the cause of a bus crash which killed at least 14 in the Bronx on March 12, 2011. "It provides some parameters on what the engine was doing," said National Transportation Safety Board spokesman Peter Knudson. He noted the results won't likely be known immediately. The information gleaned from the black box will also help prove or refute the account given by driver Ophadell Williams, 40, who told police he was sideswiped by a tractor-trailer. NTSB vice chairman Christopher Hart added Monday that a review of the tractor-trailer's black box will also help determine how the accident occurred. The agency plans to interview Williams about the crash on Tuesday. Knudson added that GPS data from the tractor-trailer will also be looked at to help determine the cause of crash. In addition, the NTSB will study any physical marks left on both the bus and tractor-trailer to see if any contact was made between the two vehicles, possibly corroborating Williams' account of the accident, Hart said. "Transfer marks will be very important to determine whether there was contact," he said of studying the vehicles, noting that bus's left-front side and the tractor-trailer's right-rear side will be focused on. Other evidence that will be studied include a front-facing recorder that might have captured video of the driver, as well as a rear recorder that investigators are still not sure the bus contained. Hart said that witness accounts of the accident and records of Williams' actions during the 72 hours prior to the crash will play an important role in determining the cause. A study of traffic patterns in the immediate area of the accident, as well as a look at the guardrail that ripped off the bus's roof, will also be pursued, Hart explained. A preliminary report in the cause should be released within the next 30 days, he said, and investigators will remain at the scene for about the next five to seven days. So far, witness reports don't appear to back up Williams' account of the crash. They told investigators the bus repeatedly veered off I-95 and onto the shoulder of the highway before it overturned, a law enforcement official told the New York Times. Police contacted a truck driver who said he was actually behind the bus and saw it swerving before the accident, the Daily News reported. The NTSB has impounded the bus and is checking it for damage to support Williams tractor-trailer claim. "There does not seem to be any evidence of a truck hitting the bus," Mayor Michael Bloomberg said Monday. "And that's the only thing that we really know so far." Alcohol was ruled out as a factor after Williams blew a .00 in a Breathalyzer at the scene, officials told NBCNewYork.com. The bus flipped and skidded around 500 feet Saturday morning before hitting a sign, which nearly sheared off the roof. The death toll reached 15 Monday morning, while six passengers remain in critical condition at Jacobi Medical Center in the Bronx, authorities said. "It's very tragic," said the mayor, who visited victims in the hospital Sunday and spoke to one through a translator. Six passengers were still in critical condition at Jacobi Medical Center in the Bronx, with four unconscious and breathing with the help of respirators, hospital officials said. Doctors were "cautiously optimistic about their recovery," said Hannah Nelson, the hospital's chief of staff. She said the accident was "very devastating" and that the trauma suffered by the bus passengers was the "most significant we've ever experienced at the hospital." Nelson said one of the victims they were treating, a man who was believed to be in his 50s, had not yet been identified. St. Barnabas Hospital was treating one patient from the bus accident, a 75-year-old woman who was listed in stable condition in intensive care. The driver allegedly took a nap for several hours in the casino parking lot on Friday before picking up the passengers for the trip back to Chinatown. The driver arrived at the Mohegan Sun around 11 p.m. to drop off passengers and took a nap until he was called back to pick up a group for a trip to New York at 3 a.m, NBCNewYork.com reported. Williams was treated for non-life threatening injuries at St. Barnabas Hospital in the Bronx before being released Sunday night. The News reported that the bus company has been cited for "fatigued driving" five times in the past two years by the Motor Carrier Safety Administration. World Wide Tours issued a statement on its website saying the company is fully cooperating with investigators. "We are a family owned company and realize words cannot begin to express our sorrow to the families of those who lost their lives or were injured in this tragic accident," the statement said. "Our thoughts and prayers are with them."